A good general guideline is that a healthy dog should drink between ½ and 1 ounce of water per pound of bodyweight each day. So a healthy 65-pound Labrador Retriever should be drinking between about 33 and 65 ounces, or about ¼ to ½ gallon of water daily. If your dog is eating a moisture-rich, species-appropriate diet, they are getting some of their water needs met with each meal, so they may not drink as much from their water bowl. But if they are eating primarily dry dog food (which I don’t recommend), they may actually need more than the average daily intake to compensate for the lack of moisture in their diet. After a period of hard play or exercise, use caution when your dog rehydrates. If they immediately lap up the contents of their water bowl, rest them for a bit before you refill their bowl. If your dog is very active, it’s a good idea to have water with you when they exercise so that you can give them frequent short water breaks to keep them hydrated. 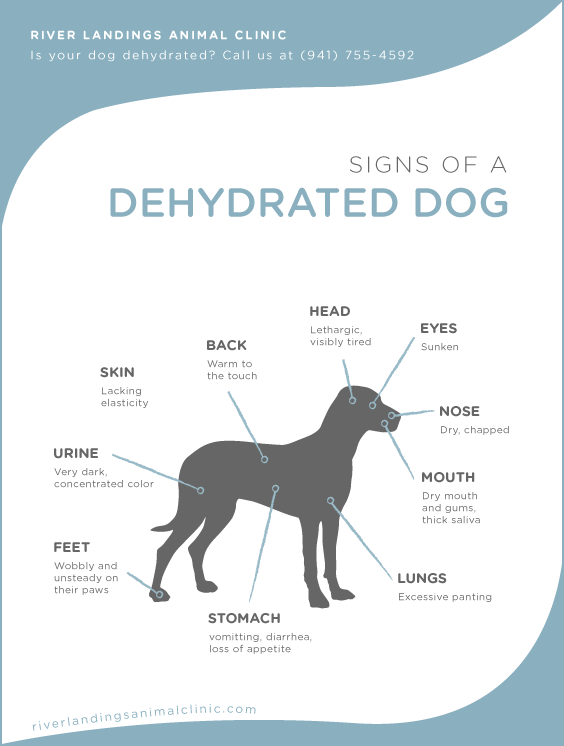 What are the signs of a dehydrated dog? To determine if your dog may need more water, lift some of their skin at the back of their neck and let it go. If your dog is well hydrated, the skin will fall quickly back into place. The skin of a dehydrated dog will fall more slowly and form sort of a tent. Another method is to check your dog’s gums. Moist, slick gums indicate a good level of hydration; dry or sticky gums mean your pet’s body needs more water. If your dog isn’t naturally inclined to drink enough water, make sure to praise them and give them a treat whenever they drink from their water bowl, and place fresh water close to all the places they frequent, like their bed and food bowl. If your dog tends to overindulge in the wet stuff, make sure you’re there to supervise their activity. The bodily condition that occurs when dogs over-consume water is called hyponatremia (or inadequate levels of sodium in the bloodstream). It is most commonly seen in dogs who like to stay in the lake, pond or pool all day; pets that lap or bite at the water continuously while playing in it; and dogs that swallow water unintentionally as they dive for a ball or other toy. Contact your vet immediately if you spot the signs that your dog may be under hydrated or over hydrated.